Famous in her era as a talented and glamorous actress, Hilda Spong quietly lived her final years in Ridgefield. At the end, she was, alas, the subject of one of the most embarrassing typographical errors ever to appear in The Ridgefield Press. The stage was in Hilda Spong’s blood. 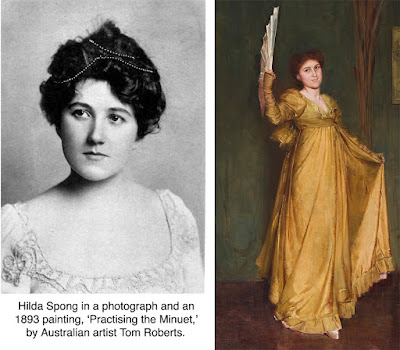 Born in 1875 in London, England, Spong was the daughter of Walter Brookes Spong, a landscape artist who was also well known as a stage scene painter for theaters in England and later Australia, where he moved with his family in 1886. Spong was also painted by America’s acclaimed artist William Merritt Chase; that life-size, full-length portrait belongs to the Virginia Museum of Art in Richmond. Around 1935, Miss Spong moved to 19 Main Street, a house she called Maplewood; it’s on the west side of the street just north of Wilton Road West. She retired from the stage a few years later.